Sherwood plastic garden summerhouse sheds exhibit ultra modernism displayed through their stylish light oak appearance. Designed by Grosfillex, a french manufacturer renowned for producing top quality PVC constructions they are available in two sizes measuring 7.5 m² and 11 m² dimensions. My passion regards ditching timely conservation issues where outdoor compositions are concerned. 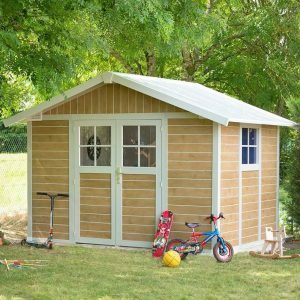 Sherwood sheds certainly make low maintenance dreams come true, specifically designed around their virtually maintenance-free PVC shell they replace yearly upkeep duties demanded by wooden sheds with an effortless wash down to rejuvenate their spotless shine. 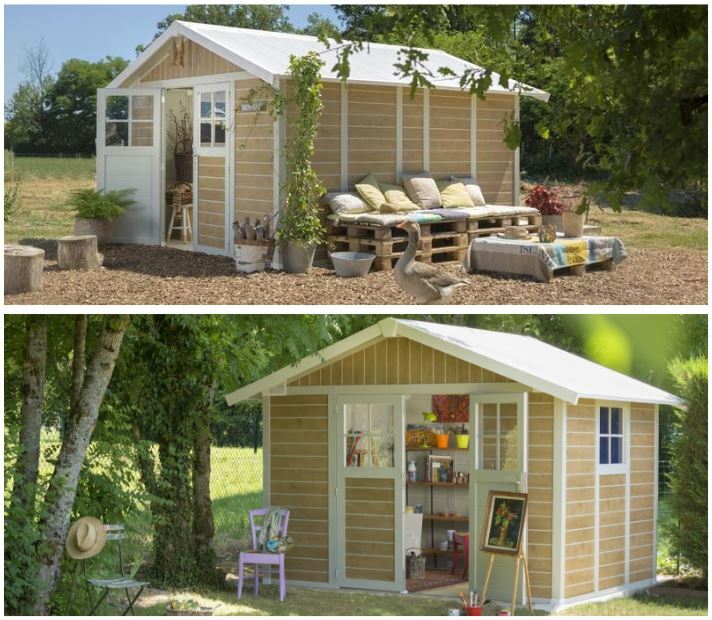 What’s your intended services regarding constructing a garden shed or summerhouse in your home-yard? Whether traditional shed services for sheltering gardening equipment accompanied with seating accommodation to hang around inside, a stylish chalet-retreat designed into one’s own personal space to escape home-life’s busy surroundings, a luxurious home-office or art studio where peace is paramount, maybe a games room, she-shed, man-cave, kids haven………..
Sherwood Deco Garden Sheds accomplish turning summerhouse daydreams into reality. Why choose a Sherwood shed? Read the manufacturers reasons behind the impressive Grosfillex design. 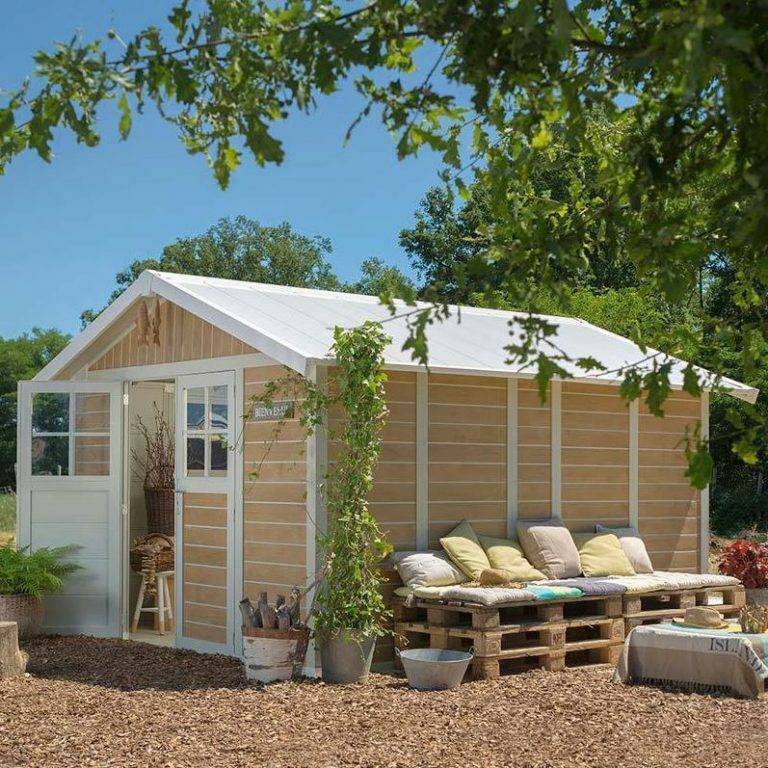 Sherwood sheds are manufactured from 99% recyclable materials delivering environmentally friendly credentials. Their wall-facade, doors and roof make-up comprises of 26 mm thick double sided polypropylene resin panels reinforced internally by a corrugated structure increasing rigidity and strength to escape the demise in appearance future dents display. 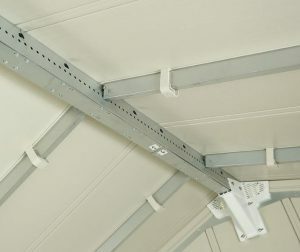 Each wall panel secures with screws to the vertical white steel struts displayed in the images up-above making up the shed’s infrastructure, the same principals apply to the roof structure delivering robustness to the entire construction whether subject to blizzards, heavy snowfall, driving rain or sat in hot climates they are designed to survive constantly changing weather conditions. Inside Sherwood’s represent a spotless bright neutral appearance to complement the colours of any furnishings whilst the outer layered walls are coloured with light oak pigments delivering a traditional appearance enhanced by the natural look of wood grain embedded within the surface produced by Grosfillex’s super stylish heliographic printing process delivering enchantment to the overall finish. The wall facade displays a horizontal panelling effect around all sides whilst up above the doors towards the apex peak, vertical panels exhibit. A UV stabilisation process provides the resin composition with protection against colour fade and surface splitting when subject to sunburn attack aiding to maintain Sherwood’s wondrous looks without succumbing to perished appearances sun-bleaching effect portrays. Sherwood’s PVC composition trumpets out weather-defence advantages resisting decay whether subject to damp conditions or hot climates requiring no conservation upkeep duties associated with replacing rotting panels, re-varnishing or re-painting. Grosfillex replace yesteryear’s maintenance issues with an effortless wash-down once in a while when the muck appears. Warm water mixed with light detergent and scrubbed with a soft brush regards the elementary role required to restore their spotless display. Many simply lightly pressure-wash them down prior to the warm season commencing. 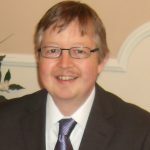 Avoid using full power jet-pressure washers or abrasive cleaners as these may damage the facade surface, just stand further away whist using a pressure wash. The roofing structure constitutes the same PVC manufacture the walls possess whilst secured around their metal framework the infrastructure bolts to the apex peak ridge beam providing well bolstered overall central support. Sherwood’s are absent from a skylight translucent strip embedded within the apex peak seen on many competitors sheds due to their central supported ridge beam however rather than truss systems spanning across the internal width, Grosfillex’s clever design creates a more homely spacious environment perfect for summerhouse accommodation whilst instead of skylights the deliverance of daylight is entered through larger facade and door windows. A nice angled roof pitch delivers an abundance of internal headroom whist equipping the top with an efficient rainfall drainage system. The roof panels protrude generously beyond the facade avoiding the occurrence of rainwater dripping in where the walls abut. Although the modern light shade of the roof panels cap Sherwood’s off with chic styling, their main advantage as opposed to roofing felt’s sudden deterioration when subject to damp conditions regards their resistance to weather-decay without capitulating to future re-roofing projects further down the line, the reason for their popularity. A light spray-hose down regards the simple solution to spruce up Sherwood’s roof presence. The main idea behind designing and creating your own Grosfillex summerhouse shed relates to fitting your own floor, they are not supplied with an integrated floor. 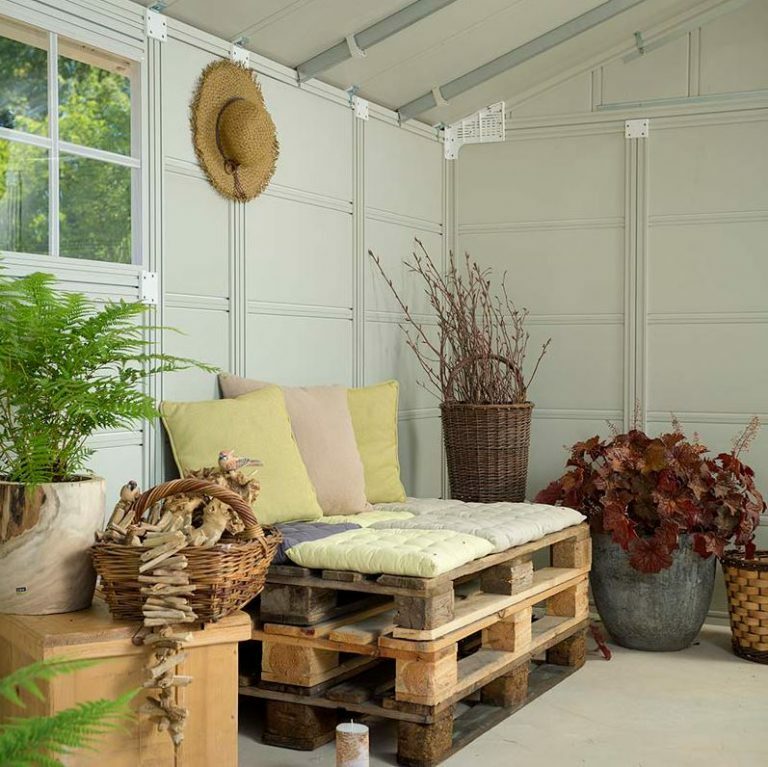 A level surface of wood or concrete prepared at least 10 cm thick provide ideal solid level foundations leaving the purchaser to leave the foundations as laid if the shed is to be used for traditional gardening services or fit an internal floor to match one’s decor and furniture dependant on what the summerhouse is to be used for. 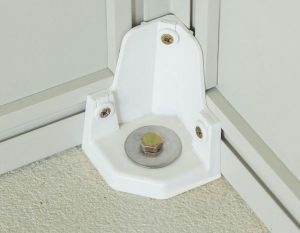 Many people extend the foundations around their summerhouse for additional outside seating accommodation, especially at the front surrounding the doors entrance. If for example, desires are to create a summerhouse to serve as a kitchen diner sat on a BBQ deck, a swimming pool chalet or a private Jacuzzi-spar hut to what I’ve just heard one family has constructed their Sherwood into then non-slip floor tiles would be beneficial. Otherwise the abundance of choice regarding wood flooring, attractive floor tiles or alternative floor coverings to match one’s furnishings, seating accommodation, office furniture, games room equipment etc, etc. Presented within each corner of the shed, anchor systems are secured to the corner steel struts accompanying the additional anchor placements running around the shed’s perimeter for securing the shed down into the solid foundations below. The type of anchor bolts are determined by the foundation material the shed is to be secured to, either wood or concrete. To make the shed watertight, sealant should be applied inside the shed where the walls adjoin the floor. Full illustrations are presented within the instructions. Additional anchoring kits designed for exposed areas can be implemented, consisting of easy-fit steel cables, clamps, tensioners and quick links. The cables inconspicuously fit within the corners of the shed whist the anchoring kit further secures the already in-place anchorage system down into the ground delivering reinforced support. Sometimes these anchor kits are supplied, other-times they are additional extras, check with the seller prior to purchase. 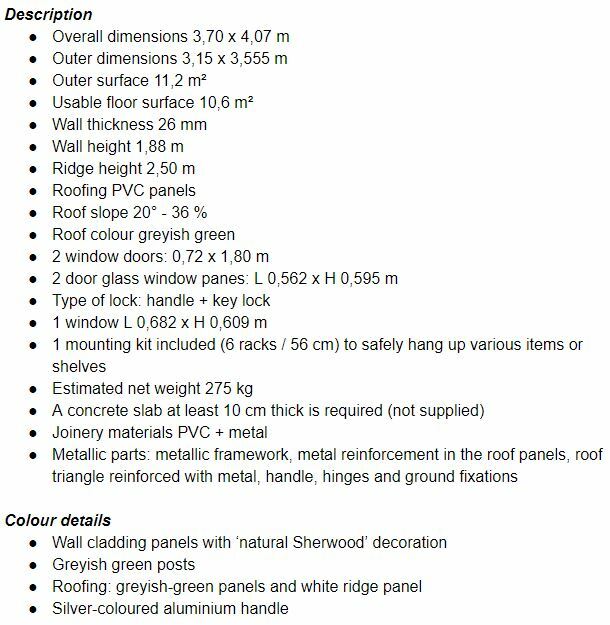 A mounting kit is usually included (check with supplier) to enable safely hanging items and installing shelving. The kit contains six fixings inclusive of screws. The fixings are cut to the desired length, their conformation slides within the structural shape of the vertical steel struts and secures with screws. Screws are then screwed into the fixings to secure shelves and hooks etc. Each Sherwood Summerhouse has the option of installing the facade window on either side of the shed to suit garden surroundings whist accompanying the large windows in the doors delivers an abundance of daylight to the interior. Within each top corner of the shed air-vents are fitted to generate air circulation to the interior, preventing a sweaty atmosphere developing and condensation building up inside, replaced with a fresh internal ambience to accompany the bright and airy feel resulting in rather a homely internal environment, a clever design. Security is a big issue to us all nowadays, Sherwood’s are fitted with traditional key-lockable door handles just like a house door providing a true door closure and security peace of mind for your secret escape. 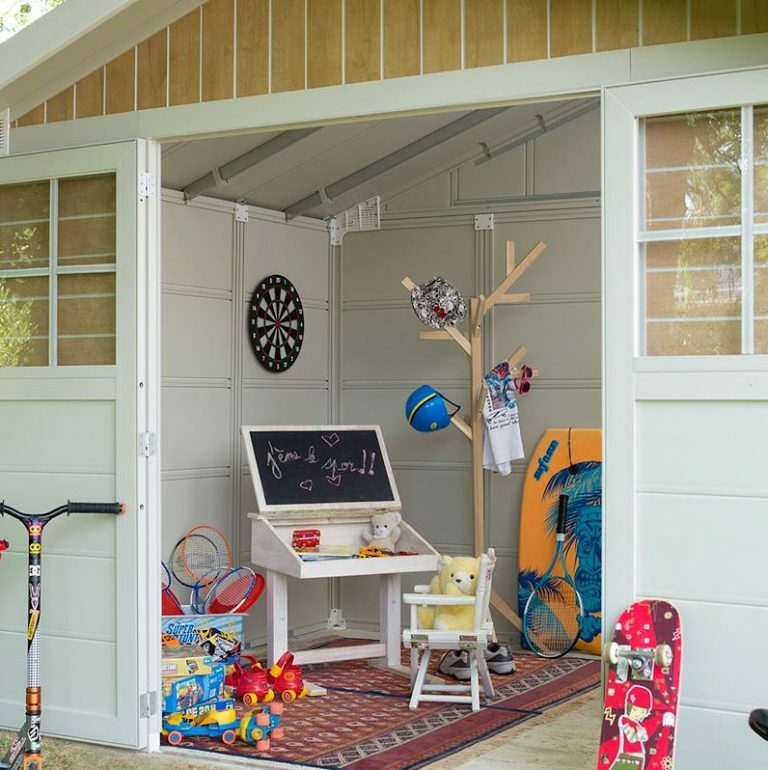 Read how Mathilde and Yvan designed and created their kids a garden games room situated in their home-yard out of the Sherwood 7.5 m² shed. Assembly regards following and implementing the step by step procedure illustrated in the instructions. Two people are required to build, one supporting the panels whilst the other secures with screws. Prior to the build, work out which side the facade window best serves your location. Refrain from assembling on a windy day, a step ladder and room around the shed’s perimeter is essential for fitting the roof panels. Sherwoods usually take two people a couple of days to fully assemble, then it’s time to step inside and customise your own personal space. Now’s the time to get your own exuberant creative juices flowing. 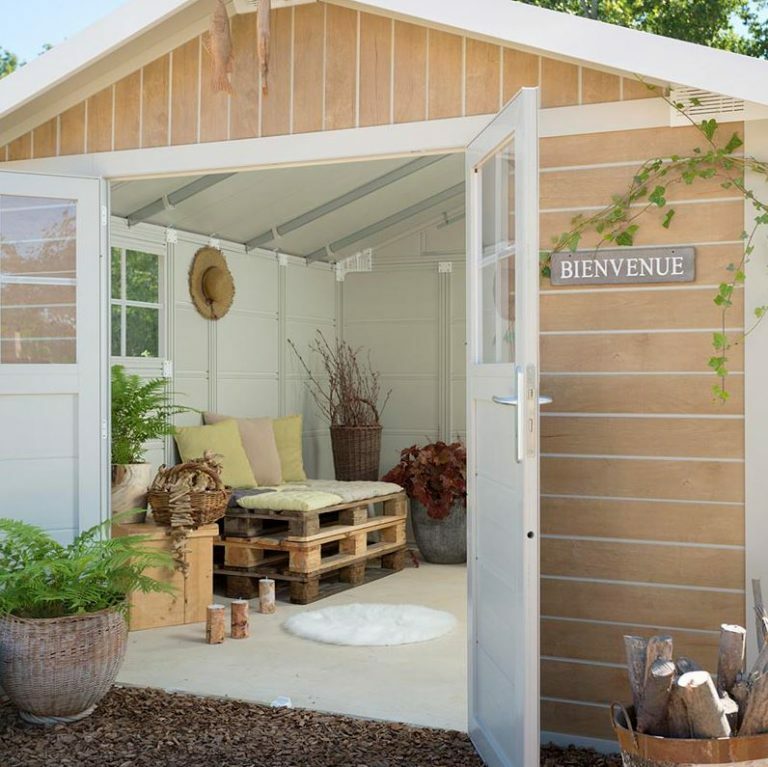 What describes your ideal garden summerhouse shed? 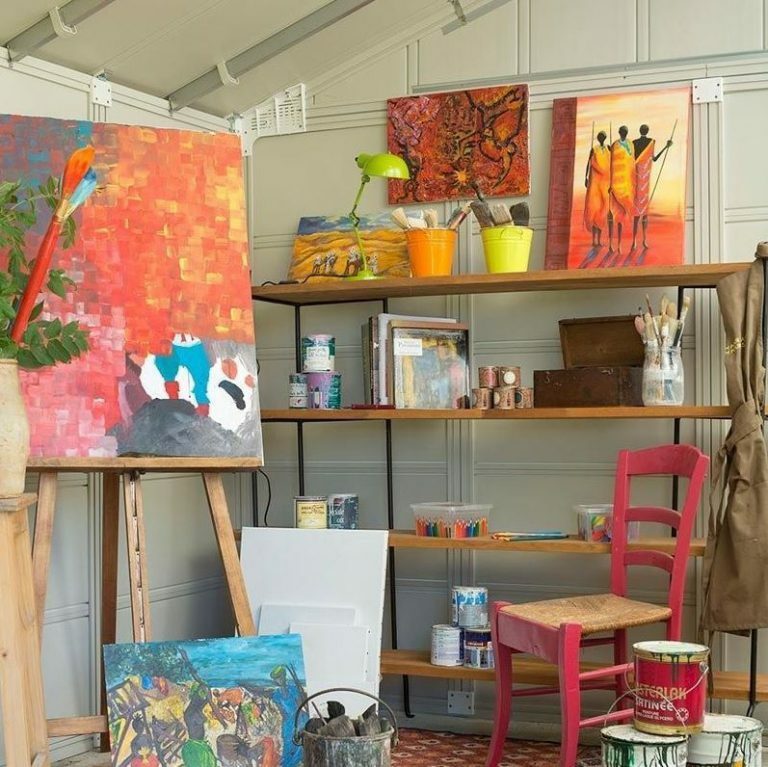 Read how Sylvie designed and created her Grosfillex shed into a kitchen diner next to her BBQ deck to ease outdoor alfresco dining when friends visit. Sherwood Deco Sheds exhibit picturesque elegance to any garden location displaying their beautifully designed light oak appearance whilst trumpeting out low maintenance values, resistant to weather deterioration, sturdy build quality with such an easy to clean surface that a whirlwind wash simply rejuvenates their shine. Inside Sherwood sheds, a bright fresh-aired environment generates through the large windows, air vents and spacious headroom expanse due to the absence of a steel truss system replaced by the cleverly designed main apex beamed support. Sherwoods are easily adaptable into a diverse range of secret garden escapes, from a private hot-tub chamber to a kitchen diner, from an art studio to a home office, from the most luxurious she-shed garden abode to a man-cave’s gaming den, from a swimming pool chalet to the kids outdoor games room. What’s your idea? Outstanding feedback regarding Sherwood’s build quality coupled with Grosfillex’s 10 years limited manufacturers warranty delivers confidence and peace of mind. Thanks for reading about Sherwood’s plastic garden summerhouse sheds. If you have any related summerhouse queries, please ask in the comment section below. Always happy to help. This post was very detailed, I am looking for a shed to put my old stuff in do you who were I can get the cheapest one that isn’t too bad quality, this looks really good but a bit too good for me , do u have any recommendations ? I’m looking for a small ,simple plastic shed and not anything fancy, if you have any ideas please tell me thanks ! Yeah these Grosfillex sheds are rather at the top of the resin sheds range regarding price, I do agree. If you are looking for affordability with a quality weatherproof resin construction then take a look at Keter’s Factor range of sheds. These start off from 6 x 3 ft with 6 sheds leading up the range to the largest 8 x 11 ft. They are a Global best seller, no frills quality construction that receive superb feedback. We purchased one years ago before many of the new resin designs entered the market. One of our neighbours purchased and constructed one a month ago too and it looks fab in their backyard. How are these sheds at repelling summer heat versus getting extremely hot, like being stuck in a hot car during a hot summer day? Where they designed with the idea of keeping people from overheating while using the shed? Or, are they more for storage, perhaps? Do these sheds tend to trap summertime heat, similar to cars? Thanks for dropping by and reading about the Grosfillex range of plastic garden summerhouse sheds. These sheds can either be used for storage however they are specifically designed for customising into your own garden room. You have asked an important question regarding interior heat. Within the features section up above I mention air vents are fitted within each corner of the shed to which generate a current of air to the interior delivering a fresh internal ambience. These are specifically designed to deliver the cool air current from outside, get rid of any sweaty atmosphere plus prevent condensation building up on the inside. Grosfillex interiors are purposely designed for adapting into a diverse range of outside living accommodation from a home office, kitchen diner, kids games room to a Jacuzzi spar hut or maybe a secret escape from home-life’s busy surroundings.